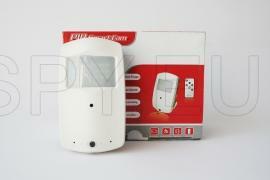 This is a multifunction device hidden in fake security volume sensor. With it you can record audio and video files or conduct surveillance in real time. This device has no battery and it will work only when connected to the main grid-circuit. This way you can rest assured it will not stop just before the right moment. The camera is equipped with a remote control. Thanks to it you can control all the camera functions from up to 10 meters. Recordings are stored on the micro SD card (not included in the kit) with a maximum capacity of 16 GB. You can choose between two modes and manual "Motion detector" mode. You have the option to specify whether to overwrite the oldest file or stop recording when the memory is full. Sensor, which also holds the camera is completely realistic and would not be suspected in any way when you mount it on the ceiling. Using the device is easy and convenient thanks to the remote control. With it you can remotely control all functions of the hidden camera. Installation and removal of the sensor is only unwinding it so you can easily download and save the files to your computer. 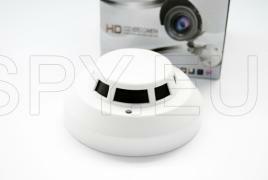 With the camera you can pictures , audio-video recordings and use the software motion detector. The camera is mounted in a completely realistic smoke detector. To be able to remotely control the functions of the device you have a remote control. The "sensor" has LEDs that let you see what is happening even in complete darkness. With this camera you can take pictures with resolution 4032x3024, audio-video recordings 1280x720 25 fps. 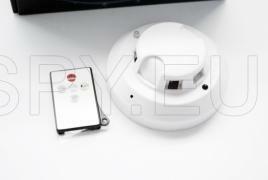 There is a software motion detector to record only when there is motion within range. The camera is mounted in a housing that looks like a smoke detector. It records on a microSD card, you can put up to 32 GB SD cards. Mounted on the ceiling it can be easily taken down to be get the memory card out. 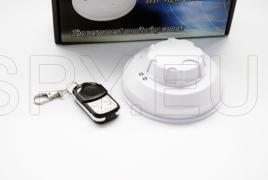 For more convenient operation of the camera it has a remote control. From a distance of 10 meters, you can manage all the functions of the device. The product offers four options. You can make audio video recording in AVI format with 1280x960 pixels, take JPEG pictures with 2MP, audio in WAV or use the motion detector to record only when something happens in front of the lens. The camera has 72 degree angle and minimum illumination 1 Lux. 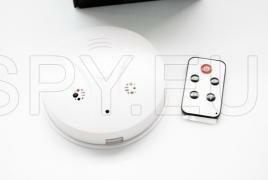 This smoke detector looks completely realistic and no one will suspect that it is a hidden high resolution camera. With this camera you can record at night because it has infrared LEDs for night vision. The device is equipped with a motion detector and you can save memory and battery by recording only when it's necessary, when there is movement in front of the camera. To easily and conveniently control all functions there is a remote control to help. You can operate the device from a distance up to 15 meters.